Having absolutely no experience with vehicle maintenance, I try to restore a 1970 Triumph Vitesse back to usable condition with no money, no tools and no idea where to start... The title comes from a fortune cookie I had once - and it looks like this project could cost me that fortune! We're going to make a decision in October whether to keep the 7 and lavish some time and money on it so it's back to being it's best, or sell/trade it in for something else. Sarah likes the roundtail spitfires so one of those might be on the cards. 2x new wing mirrors ordered from Robsport with a temporary 2nd hand hood bag (until I get the mohair one sorted). Car now on a battery conditioner so hopefully will start better. New stereo ordered (as per Hugh's recommendation). Will get it taxed next month as we're off the the Isle of Wight in May for the TSSC Camping weekend, and 6 months tax will take us past the TSSC Lincs weekend in September. So the car will hopefully be fully operational again in the next two weeks. 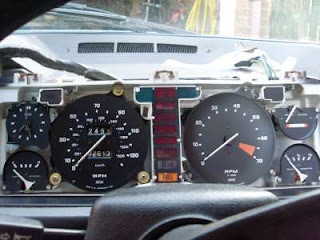 I may even have the Z3 wind-breaker fitted! The Vitesse has the front springs fitted to the shocks (Thanks Keith), and as soon as I've got the front wishbones back - there's a chance it will sit on it's own wheels. Would like to have the engine overhauled and fitted, along with the propshaft and brake pipes this summer if at all possible. Slow progress, but progress none the less!!! Hugh Glossop has found that the following MP3/SD/USB fits nicely into a TR7 (no CD mechanism though) - Radiomobile head unit model number RM7628NCD. The TR7: Electrics all fixed. Bubbling to drivers door, holey footwells and some minor paint bubbling elsewhere to sort. Towbar and electrics fitted and a trailer bought (funky slightly not-legal plate - below). Got an Z3 wind deflector to fit and a blue mohair hood cover. Got all the trim for the door seals. Want to replace the hood in 2012 with a new blue mohair one. Need to repaint all the black trim. MOT passed. Should be back on the road in the summer and looking presentable. Need to find shallow MP3/USB radio. 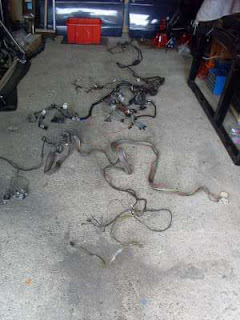 Today was the first part of sorting out the miriad of electrical gremlins on the TR7. 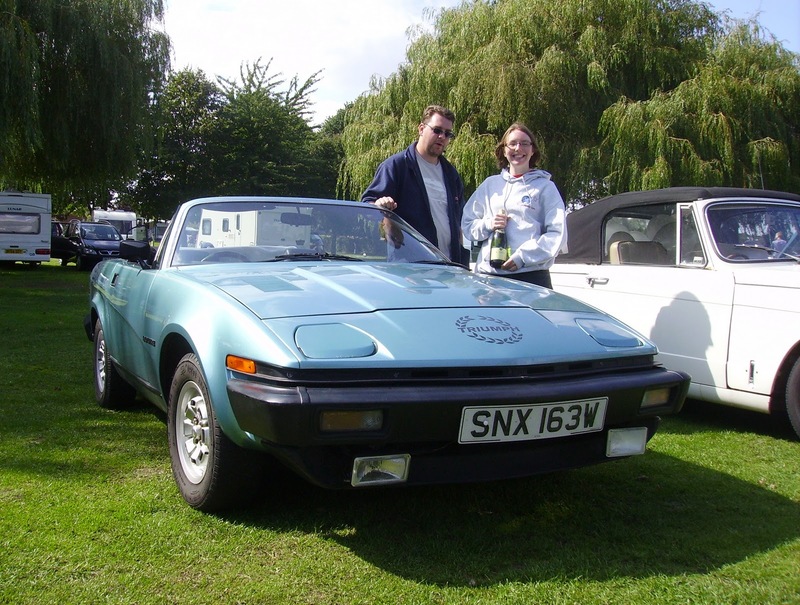 A run to Stoneleigh Triumph Show, after not using the car since October, highlighted the issues. Four new tyres via blackcircle.com and tracking sorted (18mm out!) has transformed the handling. Temp gauge went straight to high, fuel gauge tempremental, clock stopped, left indicator stayed on, right indicator did a funky pattern etc. I had bought some spares from Robsport to keep me going which included a complete loom, a spare dash pod, a upgraded flasher relay and an extra circuit board. 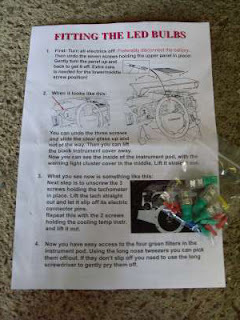 I also got hold of replacement LED bulbs for the dash via Odd on the TR Drivers messageboard which should help. 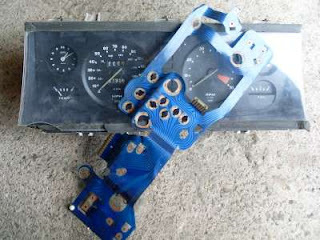 The good news is that I now have a working temp gauge (wasn't the sender, although I replace this and covered myself in coolant first) after swapping the old one with the one from the spare dash. I put the hazzard lights flasher unit (from the spare loom) onto the indicator circuit and that now works - at some point I'll upgrade with the new uprated flasher unit. The fuel gauge is now working properly too (not sure how!). Having bought it the day before the TSSC Stafford show and driven it down from S&S to Lincolnshire, and then the next day to Stafford - it's been surprisingly good. As an aside - I thought Stafford this year was the best yet - mainly due to some great company on the Sat & Sunday eves - and really getting involved this year and helping out. 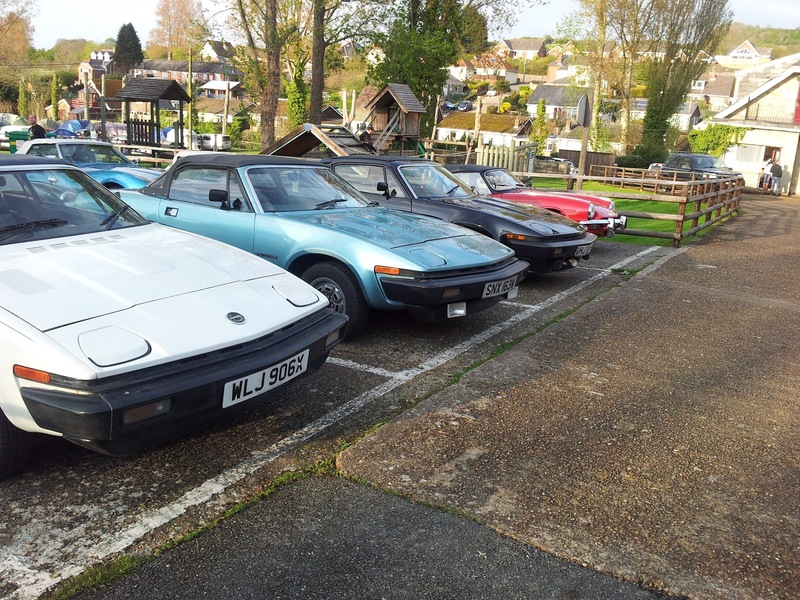 I'm becoming far more involved in the TSSC these days (as I'm working heavily on redesigning their website) but still hoping to join in with Club Triumph and the TR Register - it's a shame that the local clubs don't join together more. I've done over 1000 miles in the wedge in the last couple of months and I have gone from thoroughly hating everything about it (the looks and the driving) to quite liking it. As this was bought as a birthday present for the other half - I'm trying to get it to being reliable and safe as soon as possible so she can start enjoying it. The faults on the car so far are a leaking roof at the front, roof poppers all broke when used, broken courtesy light, tempremental fuel guage, clock only works when ignition on, sticking accelerator, duff guage/interior lights, a failed headlight, non-working front and rear fogs, a right-turn indicator that does a funky pattern, and a annoyingly random cut of power (about 1/2 sec) every now and then. It bump steers badly too. 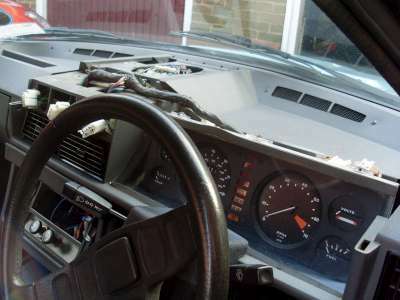 I have since buying the car, replaced both headlights with halogen units, sorted door light, sorted the accelerator, fitted a new vent/radio bit of the dash and sorted a dodgy headlight switch cable. I have bought, but not yet fitted, new green stuff front pads, a complete LED bulb kit for the dash, replacement hood fasteners & riveter, glass guides for both sides, and a kit to fit a new stereo as it's mssing one. 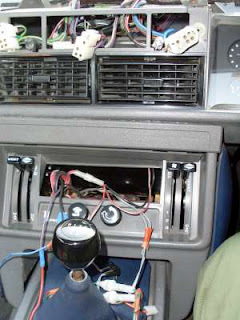 On the 'to buy' list are new clock, fuel guage & sender, reostat switch and knob, new cigar lighter, new lighting bar for the dash switches & bulbs. I'll also be looking at the engine electrics to sort out the cut-outs. In the spring, I'll get the alloys refurbished. I'll also get the little bits of bodywork sorted (light pods, bottom passenger door, and rear seams) and get the car properly polished up professionally. A new blue mohair hood is also on the cards. After spinning the car a scraping an alloy when going over a train crossing at 40mph will see this take a priority. 4x new decent tyres and a full balance and tracking will be the first step. Otherwise it'll be a complete suspension rebush and replace. 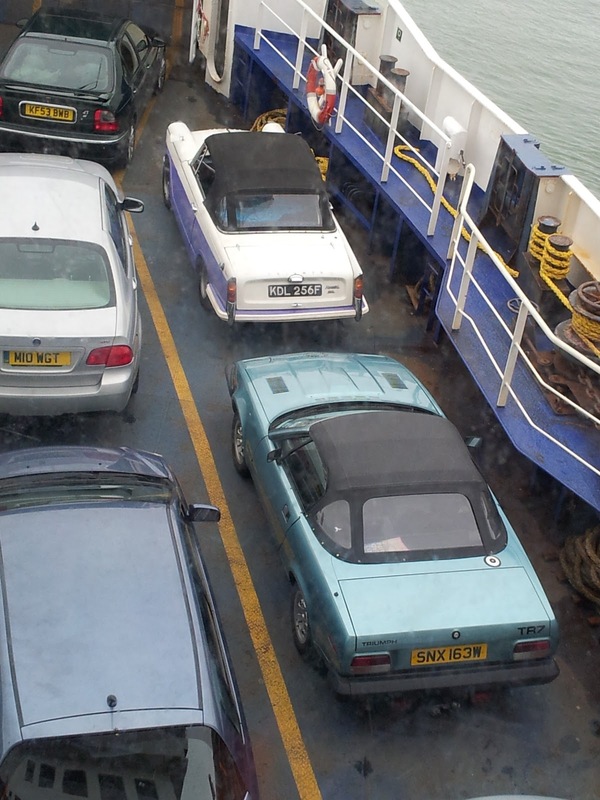 All this time with the wedge, has meant the other car, the Vitesse has been left alone. Over the last few months I have bought a new Swing Spring conversion kit from Canleys, complete with a 3/4" lowering block. I have managed to get some half-shafts from the TSSC Stafford show too. Canleys have also provided some refurbished vertical links. Armed with new bolt kits and a fully polybuish set - it was time to start 'swinging into action' but it seems that I have managed to get water into the diff whilst in storage - so rather than emptying it of oil before proudly (and finally) starting the rebuild - I just got rusty water and a seized diff instead. So I'll have to wait for a visit to Mike Papworth before starting work. Simon Oliver. Picture Window theme. Powered by Blogger.